Like thousands of others, I participated in the ALS Ice Bucket Challenge to raise money for ALS. If you aren't familiar with the challenge, the deal is that, once challenged, you have the option to either dump a bucket of ice water on your head and donate $10 to www.alsa.org, or skip the ice and make a donation of $100. As of today, more than $103 million dollars has been donated to the organization. More importantly, people are talking about a horrible disease. For many, amyotrophic lateral sclerosis is better known as Lou Gehrig's disease. 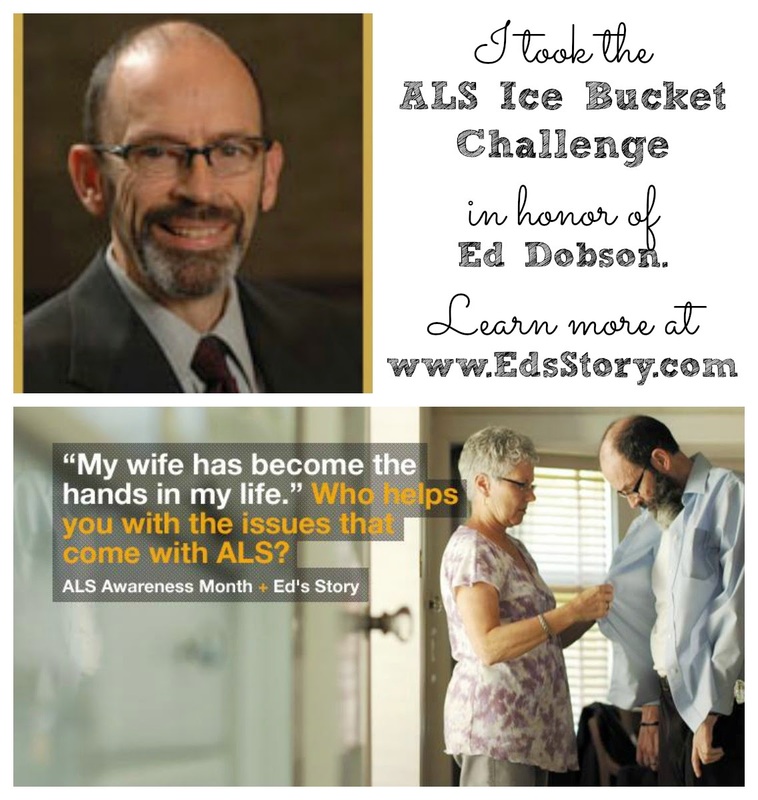 For me, ALS is also known as Ed Dobson's disease. Ed Dobson was my first pastor when I moved to Grand Rapids, Michigan in 1999. It was a very large church and easy to find, so I thought it would be a good place to try to make some friends in my new city. I quickly got involved in singles ministry and met some of my closest friends. Prior to coming to Calvary, Pastor Ed was best known for his work with the Moral Majority and Jerry Falwell. After becoming disillusioned with politics, he moved to Grand Rapids, Ed ruffled feathers by becoming and early advocate for those living with HIV/AIDs in West Michigan. He became less concerned about power and more dedicated to mercy. Even though he preached to audiences in the thousands, he was still approachable to individuals. Lean and healthy, I remember being impressed by the way he lead hiking trips with young people from the church. Then, in 2001, he was diagnosed with ALS. ALS is a vicious disease, slowly taking away a person's ability to control their body, starting with large limbs--arms and legs--and eventually robbing them of their ability to move, swallow, and finally, to breath. It's a long goodbye. When Pastor Ed was diagnosed, he was given two-five years to live. He's been around for thirteen, and has made the most of these years when his brain is willing and his body is weak. He's written a couple of books, including Prayers and Promises When Facing Life Threatening Illness and Seeing Through the Fog: Hope When Your World Falls Apart, as well as several DVDs as part of Ed's Story. In the flood of posts and columns being written about ALS as a result of this challenge, the one that has stuck with me the most is the one by Bo Stern, who wrote "What An ALS Family REALLY Thinks About the Ice Bucket Challenge." I highly recommend you read the entire post, but here's the take away: The Ice Bucket challenge is a fundraiser to be sure, but take the time to learn a bit about the disease, too. Here are her suggestions for "walking a mile in ALS shoes." If you would like to experience just a tiny corner of an ALS life, I have a list of Empathetic Experiences for you. These are things you can do to walk for just a mile in ALS shoes. If you try one, take a little time at the end to consider that people actually living with the disease have a million miles more to go. Pick up a 10-pound weight. Now imagine it’s your fork and move it from your plate to your mouth repeatedly without shaking. Sit in a chair for just 15 minutes moving nothing but your eyes. Nothing. No speaking, no scratching your nose, no shifting your weight, no changing the channel on the television, no computer work. Only your eyes. As you sit, imagine: this is your life. Your only life. Borrow a wheelchair or power scooter and try to maneuver quickly through the aisles at Walmart, without speaking. Note the way people react to you. Strap 25 pounds to your forearm. Now, adjust your rearview mirror. Using none of your own muscles, have your spouse or child or friend get you dressed and brush your teeth. Write down some of the feelings you have being cared for in this way. Before you eat your next meal, take a good, long look at the food. Inhale deeply and appreciate the aroma. Now, imagine never being able to taste that – or any other food – for the rest of your life. Put two large marshmallows in your mouth and have a conversation with your friends. How many times must you repeat yourself? How does this make you feel? Go to bed and stay in one position for as long as you possibly can, moving nothing. Strap weights to your ankles and climb a flight of stairs, taking two at a time. That’s the kind of strength it takes for someone with ALS to tackle the stairs on a good day. There have been criticisms of the challenge, for sure. That it's just a fad. That the ALS isn't a "worthy-enough" disease. That the ALS Association doesn't spend donations in the right way, the waste of water, etc. But here's what's good about the Ice Bucket Challenge: people are giving the money to help others. That's a win in my book. If you could magically raise millions to cure or alleviate a disease or condition, what would it be? Cancer. MS, autism, and mental illness topped the list of replies. Other responses included Alzheimer's, Crohn's, Marfan Syndrome, juvenille diabetes, congenital heart disease, MPS III, muscular dystrophy, lymphedema, and Prader-Willi. I've linked to organizations my friends know and trust. Of course, traumatic brain injury is the condition I've lived with for the last ten years. I would love to see more money raised to education, prevention, early treatment for those who sustain TBIs, and assisting those who live with brain injuries. The organization we give to is the Brain Injury Association of America. Oh, and in case you are interested, here I am getting soaked!